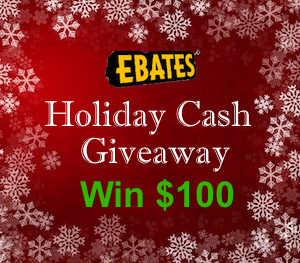 As an added bonus, Ebates is giving away a $100 cash bonus to one of my readers! To qualify, you just need to be an Ebates member. *The giveaway will end 11:59 EST on 12/23/12 and the winner will be chosen on 12/24/12. The $100 cash bonus will be added to the winner’s Ebates account. 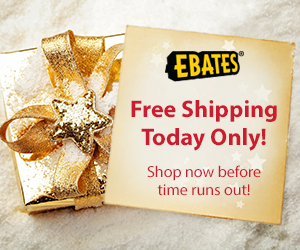 A randomly selected winner will be notified by email and must be a confirmed Ebates member. Allow 2 weeks for prize delivery. There’s still time to order gifts online and get them in time for the holidays. Now is the time to shop because there are over 1,000 stores offering free shipping deals. Amazon is even offering free one day shipping on select products between 12/17/12 and 12/22/12! 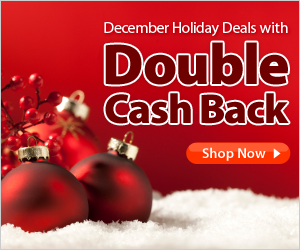 There are also tons of December holiday sales with double cash back offers. Combine double cash back with coupon codes and free shipping for some amazing deals this holiday season. If you are not already an Ebates member, sign up by clicking the form below, and don’t forget to leave a comment to enter the $100 cash bonus giveaway.